Looking to the new year, it may feel exciting, but also a little bit daunting. Challenges will roll, but how can you cope with unexpected events? Getting balance between business and career is one way to tackle this 2017. Stepping in to help is an upcoming Women in Food event ‘New You, New Business’ – hosted by the Female Foodpreneur Collective, happening on Thursday, January 26th in London. 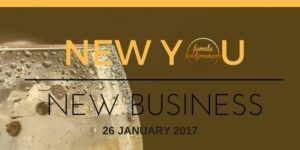 In this evening gathering, a panel of inspiring speakers from various businesses will be tackling the topic of “A healthier you = A healthier Business and Career” to help you plan ahead, with health in mind, for the new year. Maggie Richards, meditation expert and certified Somatic Experiencing therapist will share how women from all walks of life can harmonise mind, body and spirit to transform life’s traumas and trials into triumphs. Her book, A Guide to Being a Better Being, is out now on Amazon. A guest trainer from Today Fit will share how you can make your physical health a priority when building a business and career. Today Fit brings, personal training and customised fitness programmes, to anyone of any age, through online video coaching and nutritional advice. Aiming to break down expensive barriers to getting fit they help people get personalized workouts and nutritional advice, replicating the experience of 1-2-1 time with a personal trainer. Fig & Bloom – London-based nutrition and food consultancy focused on improving health and wellbeing for the long-term. Stephanie Ridley, registered nutritional therapist, and Dorothy Barrick, holistic chef and recipe developer, combine evidence-based nutrition and culinary creativity to create fabulous tasting food; helping clients to nourish themselves easily, effectively and deliciously. Ex-food buyer and management consultant Caroline Flower co-owns and manages the business. Pep & Lekker will be serving their gluten free ‘Gleaming Gold’ sweet potato and butternut squash soup on the evening. A great example of women in food rocking it, co-founder Susan Gafsen spent over 25 years working in leading City law firms first as a corporate lawyer before becoming a foodpreneur! Pep & Lekker believe we can support healthy clean eating with an active lifestyle. Komal George is a pharmacist turned spice enthusiast who founded Amala Pure Health which celebrates the health benefits of turmeric. She’ll be serving her dairy free Turmeric Honey Hot Chocolates on the night.